expect to have an exceptional day? We have so much power when we use our expectations to anticipate having an exceptional day. So why don’t we use this power? Of course our habits get in the way, our fears tell us to expect the worst so we won’t be disappointed, and our training from our families and society teaches us to do what our elders have done… be careful, be safe, and expect things to go wrong! But just imagine having an exceptional day *because* you planned for it, expected it, and acted as if it were coming your way. Wow, that would be an incredible day full of joy and gratitude, not to mention a day of wonderful surprises and abundance! We could combine last week’s newsletter One Now at a Time (https://www.carollook.com/one-now-at-a-time) with this week’s topic, Expect an Exceptional Day and make a profound shift in each day we are open to experiencing in this lifetime. Let’s say that you are accustomed to expecting the worst to happen, or that you tend to plan for things to go wrong so that you will be “prepared” for whatever happens. How hard would it be to change these habits? I invite you to try by expecting an exceptional day today, tomorrow, or the next day! and feel your energy shifting! The habit of planning for things to go wrong is a “tappable issue” with EFT. So is the fear that you might be disappointed if things work out in a different way than you expected. attract more success and abundance! (1) Yes, but… I have a habit of anticipating the worst in my day, I’ve done it for years. (2) Yes, but… I need to be “realistic” don’t I? (3) Yes, but… I don’t want to be surprised if the day ends up being lousy. I might be disappointed. (4) Yes, but… I see nothing but “downsides” to expecting an exceptional day… sounds like a waste of time to me. 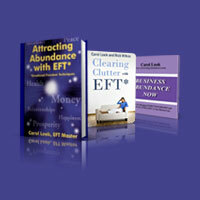 The good news is that you can treat whichever yes, buts you have with basic EFT tapping! Are you holding yourself back in your life because of any of these yes, buts or layers of resistance? If so, the yes, buts can all be formed into tappable issues with EFT/Meridian Tapping. or even your “best” day ever? (1) What’s the “downside” to planning an exceptional day? (2) Does it feel “unsafe” to plan for an exceptional day? (3) Are you more comfortable with the habit of anticipating trouble in your day? (4) How does it “serve” you to plan for a bad day? These are all powerful questions that I recommend you answer as best you are able… once you know the upside of expecting the worst, you can make healthier changes and choices about your expectations and plan for many exceptional days! Maybe you don’t believe that keeping this same pattern is serving you, but it must be, or else you would be committed, even inspired to change. enjoy your vibration of abundance! (1) Expecting an exceptional day will create energetic space in your life to access more creative ideas for your personal and professional life. Nothing suffocates creativity more than worry and anxiety. When you expect a fabulous day, you will find you have more time and energy for creativity. (2) Expecting an exceptional day will automatically raise your vibration! Remember, the Law of Attraction “hears” your vibration, not your words, so imagine what it will “hear” when you are expecting a great day! Of course when your vibration is higher, you attract other high vibration situations. (3) Expecting an exceptional day will help your body feel more relaxed and rejuvenated because of all the joy that comes from positive anticipation that will be flowing through you. When you shift your energy into expecting things to go well, all the chemicals in your body change, you can relax because you know you are going to have a great day, and when you relax, there is room for more abundance in your life. (4) Expecting an exceptional day will help you get clarity about your decisions and the next “yes” in all areas of your life. We need our signals to be clear, and expecting things to go well will help open the lines of communication between our intuition and consciousness. As Law of Attraction teachers say — it’s all energy. So change your energy by being inspired to expect and plan for an exceptionally happy day. It will automatically invite the Universe to help you create more abundance right now. the Universe join your efforts to succeed! Remember, the Law of Attraction sends you situations that have the same energy of the vibration you are putting out… so when you are intending to expect your day to be fantastic, the Universe will bring you additional experiences that will cooperate with this expectation. Below you will find EFT/ Meridian Tapping setup phrases to help you be inspired to enjoy expecting an exceptional day. you will change your life. Go ahead, enjoy yourself by expecting an exceptional day..! While tapping the karate chop spot on either hand, repeat these phrases out loud, (or change the words to fit your exact situation). Thank You, Universe for showing me *how* to plan for an exceptional day, every day. Thank You, Universe for allowing me to feel safe expecting an exceptional day. Thank You, Universe for bringing me inspiring ways to plan for a series of “best” days ever! Keep tapping, and enjoy using the Law of Attraction to bring more of what you want into your life!